Nashville, TN – October 16, 2017 – With days to go until his induction as the newest member of the Grand Ole Opry and the release of his seventh studio album, Losing Sleep, Chris Young is revealing the launch of his 2018 headlining concerts. “Chris Young Losing Sleep 2018 World Tour” will kick-off in the new year with 18 shows during the initial winter run. The tour will visit Minneapolis, MN on Friday, February 23 at Target Center. 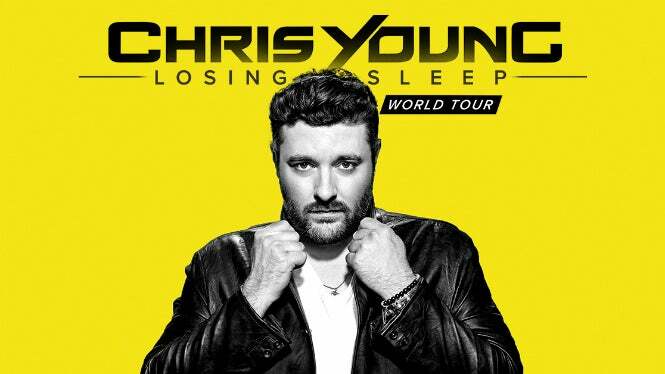 Tickets and VIP packages for the “Chris Young Losing Sleep 2018 World Tour,” promoted by AEG Presents and Concerts West, go on sale beginning Friday, October 20 at 10am (local time) at AXS.com. American Express® Card Members can purchase tickets before the general public beginning Wednesday, October 18 at 10am (local time) through Thursday, October 19 at 10pm (local time). A limited number of exclusive VIP Packages will also be available for sale starting October 17. These exclusive offers can include premium tickets, access to a pre-show VIP Hang (includes an exclusive performance and special Q&A session), limited-edition lithographs, autographed memorabilia and much more. Tickets and VIP packages can be purchased at ChrisYoungCountry.com. Enjoy VIP amenities with Spotlight!